If you like a french Version of this text. 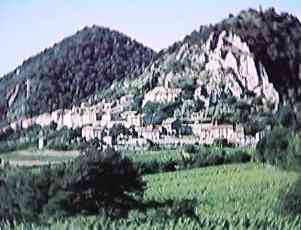 Séguret is a little winegrowers' village in Provence ( Southern France ). It lies nestling against a hillside at the foot of Mont Ventoux ( 5140 ft ) between Avignon ( 20 miles ), Orange ( 11 miles ) and Vaison-La-Romaine ( 5 miles ). Surrounded by mountains, vineyards, cypresses, figtrees and olive groves, Séguret offers a landscape that has always attracted artists and provides the ideal setting for inspiration and concentrated work in idyllic calm. At the same time it is in close vicinity to the principal artistic and cultural centres of the Provence and to numerous museums of classical and modern art. In summer there are many festivals nearby, ranging from dramatic art and opera to concerts and folkdancing. Séguret is dominated by the ruins of a twelfth century castle and allows the visitor to look over a large part of the Rôhne valley. Known since the Romans ( securitas - security ), Séguret is surrounded by a well-conserved wall with two subterranean entrances and two village gates. 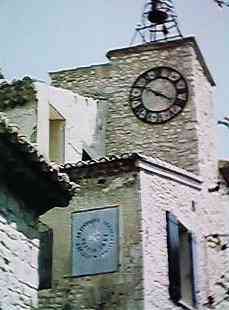 It features a church ( 9th to 12th c.), Renaissance houses grouped around a fountain and a clocktower. 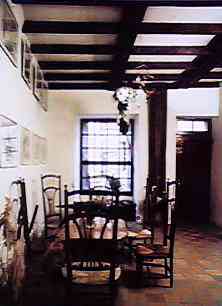 In some houses in the centre of the village the Atelier de Séguret offers 14 simply furnished rooms (a few them double rooms), a breakfastroom / kitchen, 5 bathrooms / toilets with showers, some community rooms including a small lending library, as well as workshops for painters and printers: lithography, etching, typography, a photographic laboratory for black-and white photos. There is also an inner courtyard ( e.g. for sculptors ) and a small garden amindst picturesque motifs at the artists' disposal. 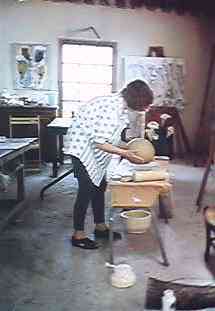 In 1970 the Atelier de Séguret received the prize "Chefs d'oeuvre en Péril" of the French Ministry of Culture and the French Television. Until now 11 films have been made about the artists' sessions (Austria, Canada, France and Germany). The Atelier de Séguret offers artists and art lovers the opportunity to participate in an edition which has been in existence since 1973. It also offers the chance to take part in international group exhibitions. So far more than 100 have been realized in Austria, Belgium, Denmark, France, Germany, Japan, Switzerland, in addition to those taking place in Séguret every year. The aim of the Atelier de Séguret is to facilitate international meetings of artists in the area of painting, sculpture and graphic arts without regard to political or religious affiliations ( Journal Officiel de la République Francaise, 13.4.1957 ). More than 500 artists from 48 countries, painters, sculptors and designers have attended and worked at the Atelier de Séguret since 1959. These international meetings of artists young of mind without age-limit take place every year from april to october. On request the Atelier de Séguret will issue a certificate about the stay. The Atelier de Séguret provides accommodation in simply furnished single rooms ( some double rooms are available ), a cold lunchpacket daily, a five-course evening meal, table wine, use of the studios and the courtyrad, e.g. 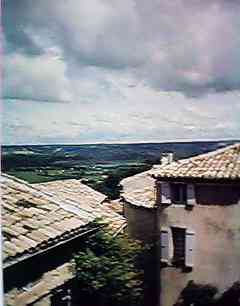 for painting and sculpture, slide shows about Provence art and architecture. The fee does not include exursions. An extra charge will be made for the use of the lithographic, etching and typographic workshops and use of the photographic laboratory as well as for artistic tuition if desired. French, German and English are spoken. Further enquiries and applications, if possible with curriculum vitae, documentation about work should be directed at: Arthur, Brigitte and Norbert Langlet - Atelier de Séguret - F 84110 Vaison-La-Romaine - Fax: ++334 90 46 80 78 - the Atelier has no telephone. Articles about the activities of the Atelier de Séguret have been published in Austria, Belgium, Czech Republic, Finnland, France, Germany, Great Britain, Greece, Japan, Netherlands, Slovac Republic, Switzerland, United States of America and Yugoslavia. Numerous collectors and museums in France and abroad have bought works realized in the Atelier de Séguret. Illustrated books and portfolios of artists about their stay at the Atelier de Séguret are available. References and quotations: French embassies abroad - Polyglott Guide: Provence - Guide Kronenbourg: Provence / Côte d'Azur - The American Express Pocket Guide: South of France - Séguret, Une Communauté en Provence, Ed. A. Barthélémy - Fotografie, Fotokinoverlag Leipzig - W. Pichner: Provence, DuMont Cologne.